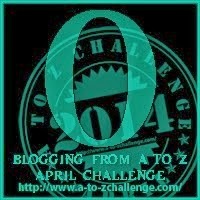 I can't believe there is Zilch to go! Before l finish, I just want to say thankfully "we are not done"! Yesterday was a special day for us. And so was the day before that. On Monday, we were almost not here for the last two letters of the alphabet. My husband and I were in a car accident on the Interstate that involved being rear-ended by a person who was distracted and driving way, way, WAY too fast. My husband saw her coming and tried to get us out of the center lane and to the right lane to avoid being hit, but she was still too fast and hit us on the back left with her right front. We spun around a few times in the middle of the highway, missing cement dividers and the overhead pass wall, and thankfully no semis or other cars hit us, though it was a busy highway and we covered most of it! I remember wondering how far the car would cave in, and could I avoid the door crushing in by leaning to the center. We did not hit anything though. I am amazed that everyone involved walked away. Our car is totaled, and resting peacefully. We had to pick up baby gifts from off the highway. Some antique dishes I had gotten my daughter at Christmas were in the back, and some of the set is broken now. But, who cares about that "stuff" - we were able to continue on in a rental car, getting there in plenty of time to see our beautiful granddaughter born early the next morning (yesterday)! Two miracles in two days. Just the two things we'd been praying for: safe travels and a healthy baby girl. and a poem for that title each day for the month of April. The poem is not about the book, but is written with the title as inspiration! Start again! this time more! I couldn't get past the door. Not again, that's not right! I couldn't get out of sight. Harry needs to blow up 100 balloons for a birthday party, but counting the balloons gets confusing. What is the best way to count to 100? Young readers help figure out what Harry needs to do to solve his math problem. Wendy Ulmer is a former music and English teacher who currently spends her time writing or running her quilt shop. She lives in Arrowsic, Maine. She lives very close to me, and has come to our school to share her book "A Campfire for Cowboy Billy". 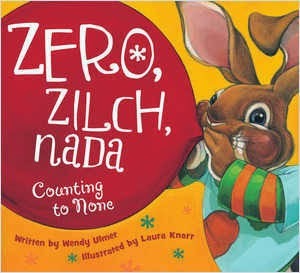 I almost used this book, Mama Zooms, with a Z in it, before I remembered to check on Wendy's book titles. I purchased this book in one of the bins of books in our local grocery store a long time ago. It's a sweet book, so I'm still sharing it! Jane Cowen-Fletcher lives in South Berwick, Maine. She is on the South Berwick Public Library Planning Task Force. She was in the Peace Corps for two years. 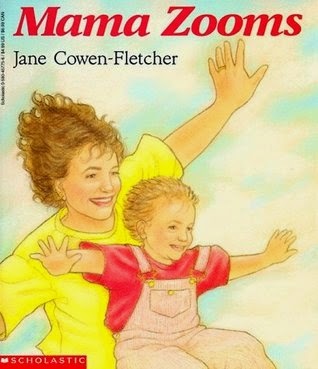 Mama Zooms is about a mother who is confined to a wheelchair. Her son, plays with his mom and her wheelchair, the "zooming machine", pretending that he is on a train, a spaceship, and more. 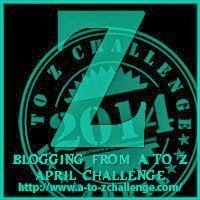 Brought to you by the letter Z! And now there's zilch, zero, nada letters left! "Yellow Dog" seems to be a "brochure*", as it is listed as such for sale privately. So I don't know if it qualifies as a book or not. Ok. All the votes are in. It qualifies. I have not read it, and I cannot find a review or synopsis of it anywhere, though. 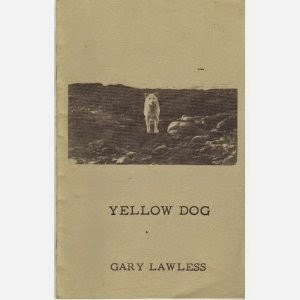 *I received an email from Gary explaining that "Yellow Dog" was a chapbook of poems written quite a while ago. "Yellow Dog" was a poem about the oldest dog in their sled team, who had passed away. Thanks, Gary! Gary Lawless is a poet, book editor, and publisher, born in Belfast, Maine. He is co-owner of the Gulf of Maine Bookstore in downtown Brunswick. Yes, this post was brought to you by the letter Y! and a poem for that title each day for the month of April. The poem is not about the book, but is written with the title as inspiration! There was no book that began with an X or EX, so I went with a word that ended in X. Here is my double Haiku for foX . Katherine Anne (Kate) Banks was born in and grew up in Maine. She graduate from Brewer High School. In Fox, a little fox, guided by his parents, learns to hunt, bury his food, cover his trail and run fast, until he is ready at last to go out on his own. Brought to you by the letter X! Y is next. Yes, I found a Y. Yes begins with Y. So does Yellow. See You tomorrow...or Yellow or Yes. And feel the mother's tie. From rocky life's hard shoals. That make us want to cry. And I think you two should meet. To help when things get rough. Our hearts are stuck like glue. Before we let her go. 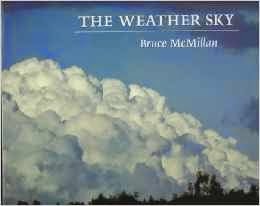 Bruce McMillan lives in Shapleigh, Maine. Years ago I went to a workshop given by him. Kevin Hawkes is a writer and illustrator from Maine. 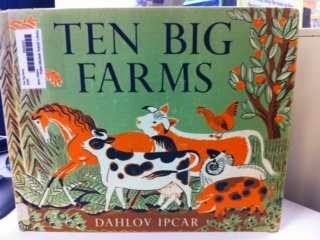 He illustrated The Pig Parade, which I wrote a poem for the letter P, and has written some Wicked Big Toddlah books. 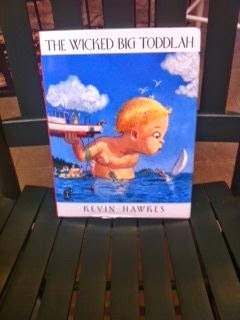 "The Wicked Big Toddlah" tells, and shows, how difficult it can be to raise a toddler - especially a wicked big one. It's a really cute story about toddler life in a giant size! Robin Hanson lives on her sheep farm West Bath, Maine. She also writes books about knitting. Brought to you by the letter W! - or "wubble you", as I used to call it with my first graders, so they'd remember it's sound was /w/ and not /d/. It's the only letter that goes by a name that says what it looks like instead of giving a clue to its sound. Okay, and sometimes I called it a "double vé" because it is a double v, not a double u. 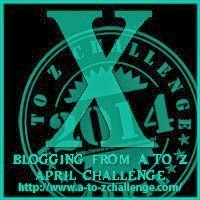 But now for our X-it............stage right. 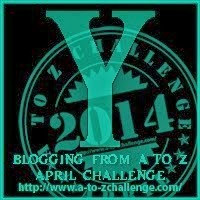 To help make up for the lack of V titles, in addition to using two titles in one poem, I will use a V poetry form: the Villanelle - a nineteen-line poem with a rhyming scheme of: aba aba aba aba aba abaa. The first and the third lines in the first stanza are repeated in alternating order throughout the poem, and both are in the last two lines of the couplet at the end. as over rocks I wend. a wide bay at ocean end. Debby Atwell lives in Rockland, Maine. "River" tells how a clean river became dirty and polluted but with care recovered. Lois Lowry lives part-time in Maine. 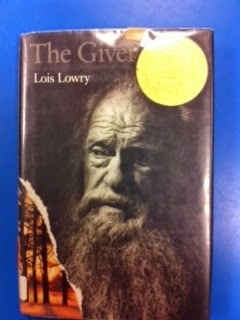 "The Giver" is about a perfect world. The Giver holds the memories of the pains and pleasures of life. I wrote this poem first when I wasn't sure I'd find a V title (which technically I didn't do).This book began with a V, but Jill Krementz is not a Maine author. 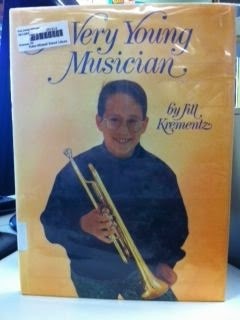 However there is a connection to Maine, in that the ten-year-old trumpet player, the subject of her book, is Josh Broder from Portland, Maine. "A Very Young Musician" shows, in photographs, Josh and how his music plays a role in his everyday life. Could toot a tune, he found. To give a sound quite right. As I watched from inside. And every note pure gold. 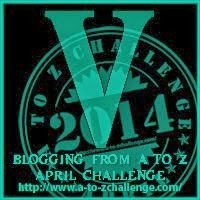 Brought to you by the letter V! Wonder where the Wubbleyou went? Scoot to the bottom if you are here for Poetry Jam! You'll find the Desert there! 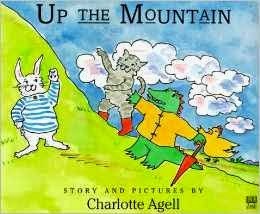 Up the Mountain is a young child's book about four friends that go up a mountain on a not so sunny day, but spend the day together on their trek, which ends up in a nice day. Harriet Beecher Stowe lived in Brunswick, Maine, when she wrote Uncle Tom's Cabin. Her husband was teaching at Bowdoin College there from 1851-1853. Uncle Tom's Cabin Available through Amazon here. Download and listen to Uncle Tom's Cabin at this site - LibriVox. It is in the public domain now. 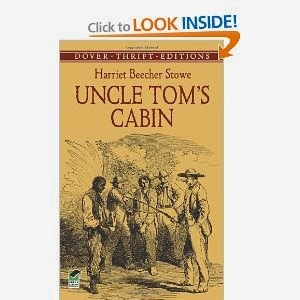 Online text of Uncle Tom's Cabin here. or a variety of ways here, Kindle included. 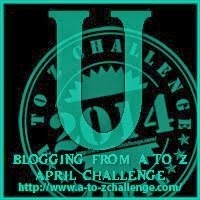 This post was brought to you by the letter U! AND inspired by Wendy Burke's line: "it was hard to tell the deserts from the seas"
leaving white spaces as clouds. bending low by the stone wall. I just added this one below at 9 am. I just keep revising the poem. I now have put this one up, too. What do you think? Maybe I should keep working on it again some day later? 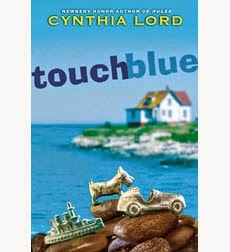 "I will color a blue sky,"
"I will paint blue waves,"
I have used Cynthia Lord's book "Rules" for my R post on Monday. Check out the links below for lots of great information about this author and her books. The state of Maine plans to shut down her island's schoolhouse. The islanders plan to increase the numbers of students by having several families take in foster children. Tess' family is taking in a 13 year old boy. 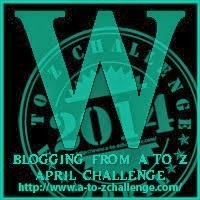 I featured Dahlov Ipcar my first post of the A-to-Z Challenge with her book Animal Hide and Seek, and then on the third day I had another poem for The Cat at Night. Please check back there for more information on this wonderful Maine writer and artist, who is practically a neighbor of mine...and I should let her know I have her books featured here...what was I thinking? 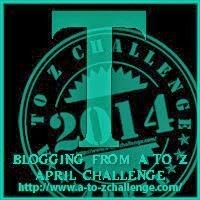 This blog post was brought to you by the letter T! I've focused mainly on children's books, with a few others sprinkled in. 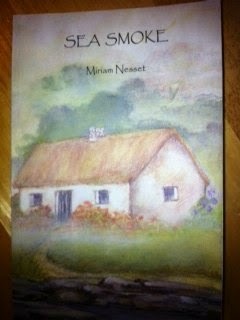 Thus most poems are of more interest to children and the young at heart! in our house in the field. in the dark to look here. and not on the sea. 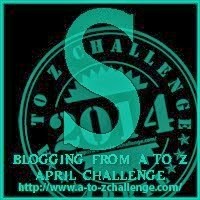 Toni Buzzeo is a school library media specialist in Portland, Maine. Please take just a few minutes, to read this interview that talks about the writing of the story "The Sea Chest". 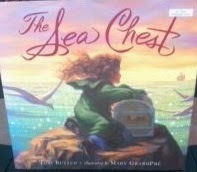 The Sea Chest is the story about a little girl's sheltered life on an island, living in a lighthouse; and the sea chest, with precious contents, that gets washed ashore one stormy night. Here's a video of the building of Toni's Writing Cottage. My husband and I had been talking about a Writing Cottage for me! I'm going to show him this - just in case I need more ammunition for the need. But I don't think I need to. We already have a plan for it. I'm excited. My spot here at the kitchen table is not good when he is home. He needs the kitchen for eating and taking breaks... often in the middle of one of my thoughts. Wouldn't it be great to have a Writing Cottage? Miriam Nesset lives in Maine. She is originally from Wisconsin. In 2009, she moved to Maine to continue her writing. She has been writing since the age of eighteen, having published one of her Haiku poems, and self-publishing three books of Haiku poetry. She has also written Georgie Blake and the Bushie Sisters, Murder in Between, Kat the Cat and Sea Smoke. Sea Smoke is an historical novel taking place in the 1730's New England Woodland Rebellion. It is a mystical love story and mystery about being shipwrecked on a remote, sea smoke surrounded island off the coast of Maine. Brought to you by the letter S! Let out a big squeal! I think you’d have wings. Go right for the roots! Oh, look, the fish drowned! Don’t burp at the table! Just keep to a walk. Don’t write on the wall! Don’t slouch and don’t grouch! Don’t climb or you’ll fall! Don’t pout when you lose! Be nice to your friend. It could be a trap! I tried to try a Rondelet for "Rosebud & Red Flannel, but I forgot about the rhyming scheme (that's why it is down here at the bottom now. My "Rules" poem I came up with to replace this one.) I played with it some more and just made it worse, so here's what a Rondelet is - a French poetry form with a septet (7 lines) with two rhymes and one refrain: AbAabbA. The capital letters are the refrains, or repeats. The refrain is written in "tetra-syllabic or dimeter" and the other lines are twice as long - "octasyllabic or tetrameter". Now, to be honest, I don't have a clue what anything between those two quotes means. I know what "Tetris" is and "octopus" and "diameter"... I'm going to go do some research and see what I can understand. I vaguely remember not being able to understand it in high school. I do understand rhyming pattern and number of syllables though, so there's no excuse there. Ethel Pochocki has written many books for children, including The Attic Mice, Rosebud and Red Flannel, and Maine Marmalade. She lived in Brooks, Maine. The illustrator, Mary Beth Owens, is from Walpole, Maine. In this book, a nightgown, Rosebud, and a pair of long johns, Red Flannel, are blown off the clothesline in a snowstorm. They would usually hang side by side on the clothesline. 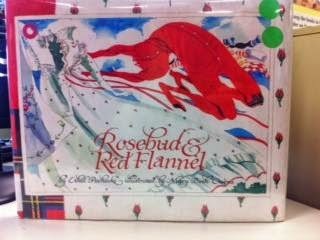 Red Flannel loved Rosebud, but Rosebud was a little too refined to give Red Flannel the time of day. When a snowstorm comes up, Rosebud and red Flannel are blown away and to on an adventure together. 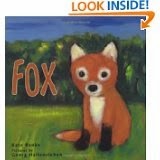 This book has beautiful watercolor illustrations, and was a Lupine Award winner. When I was doing another search for books, I discovered (remembered really) that a teacher at my high school was also a published writer, as was his wife. 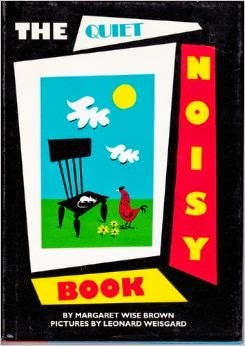 One of the books he wrote, Reasons and Raisins, a children's book, was published in 1976. How could I leave it out of a Maine authors list? Couldn't. So here it is. Richard Aldridge lived in Sebasco Estates, Maine. He was a 1952 graduate of Amherst College, and published his first poems in New Poems by American Poets in1953. He was granted a Fullbright Scholarship at Worcester College, Oxford. He worked for the publisher Doubleday and Company, and later moved to Maine. In 1958, he married Josephine Haskell, having met her at camp in the Sebasco Estates area, where they then resided. He taught in Bath at Morse High School and at Hyde School, retiring in 1985 to devote his time to writing poetry. He died in 1994. I, unfortunately was a teenager in high school when I knew him, so was pretty much unaware (as is the custom of most teens) of the resource and knowledge available at my fingertips. My poem is a bit "If You Give a Mouse a Cookie"-ish and unrhymy. "If You Give a Reason for a Raisin, He'll be Raisin' Questions to Get a Reason"
"Why do we need grapes?" I'm plum out of reasons." Why do we have plums?" This post was brought to you by the letter R! It's Easter Sunday - a scheduled post for this blessed, glorious day! See you back at the R(anch) tomorrow! I have two poems for this title! I wrote this one first, but then I thought I'd like to have one with a classic form. So I wrote a Quatern for the second one, which I will explain below. Which do you prefer? 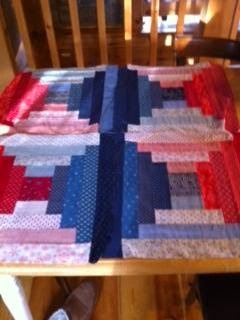 I also posted some pictures of some quilt blocks I sewed by hand (needle and thread, no machine) back 30 years ago! I found them when I was looking for some photos (which I never found). A Quatern is a French form of poetry. It has sixteen lines of four quatrains. Its refrain is the first line of stanza one, the second line of stanza two, the third line of stanza three, and fourth line of stanza four. There are eight syllables in each line. So which poem do you prefer (that's assuming that you like one of them)? I came this close [-!-] (see the two dashes are very close to that ! - Hey, now it looks like my cat's face!) 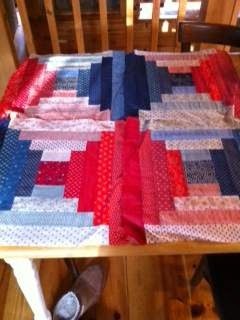 to writing a silly poem about a Bee that quilts...and maybe I will, as it is still buzzing around in my head. I'm looking back on what I just wrote there and wondering if I could be a little ADD? 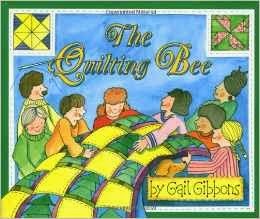 The Quilting Bee by Gail Gibbons was written in 2003. Gail Gibbons writes and illustrates children's non-fiction books. Although she also lives in Vermont, since 1986 she has spent several months of the year on Matinicus Island in Maine. She received the Katahdin Award 2009, a lifetime achievement award presented by the Maine Library Association in recognition of an outstanding body of work. 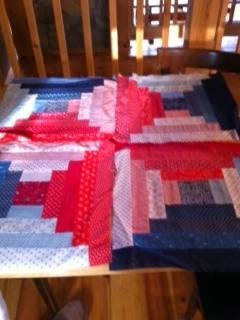 The Quilting Bee is, as all Gail Gibbons books are, non-fiction. 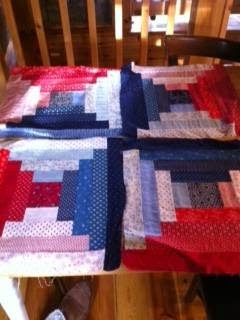 It explains what a quilting bee is and how a quilt is made in very easy to understand language. I found this book first and was going to try a poem with it, but then the quilts won out when I found them. And the one above won of the three quilt books I found. 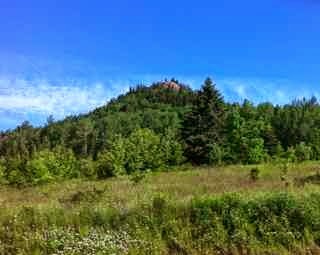 The Memory Quilt was written in 1988 and is about an orphan boy who has a difficult time adjusting to life with his grandparents on a Maine island. Elizabeth McKey Hulbert is a children's author and illustrator who lives on Mt Desert Island. The Queen's Twin (1899) by Sarah Orne Jewett - author of "The Country of the Pointed Firs"
Here are my quilt blocks arranged three ways - the bottom two would be two parts to the same quilt. I have 12 full blocks and 7 partial. I should put them together, shouldn't I? But which pattern? I'm kind of drawn to the pinwheel look of the bottom two...maybe. This post was quite rightly brought to you by the letter Q! R U E 4 R? I wrote two separate poems for P - preposterous! 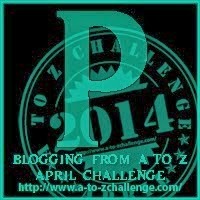 It is also Poetry Friday ----which is also a P word! 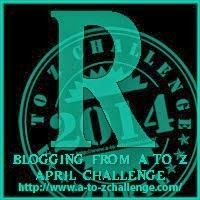 Head on over to Life on the Deckle Edge where Robyn Hood Black is hosting some good poetry today. Or how an orange grows. When their voice creeps low to whispers. Did you know all of that? Well, there you go, you've learned a lot! You'll need a rested head. Mary Beth Owens wrote and illustrated Panda Whispers. She also wrote A Caribou Alphabet, which was selected by Parenting magazine as one of the ten best picture books of 1991. In 1995 she was awarded the Lupine Award and the Christopher Award for her illustrations in Prize in the Snow. Mary Beth Owens lives in Walpole, Maine. 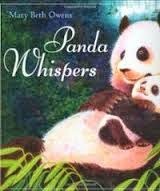 Panda Whispers tells what different animal parents might whisper to their offspring as they go to sleep and dream. Get those piglets to wiggle! Though they aren’t very neat. And corn off their snouts! Tie balloons to their tails! The author Michael Ian Black is actually from Connecticut, but the illustrator, Kevin Hawkes is from Maine. So I am technically cheating on this one, but I don't care. I like the book and the illustrations. In A Pig Parade, the reasons for not having pigs in a parade are listed. 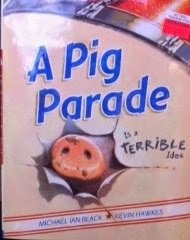 The illustrations are great, with pigs being pigs - real reasons for not having a pig parade. Why do you think a pig would make a bad majorette? This post was brought to you today by the letter P! Again today, I used both books in the poem. They just seemed to go together. They would be the start of a good spine poem! And no fowl with a beak or a bill. "Go away, you old cat!" 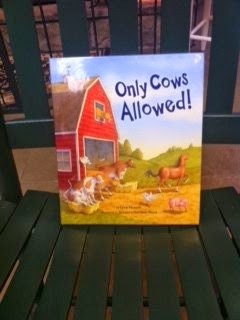 This is a strictly "Cows Only" affair. At the foot of the hill, not the brow. Though you still might be taking that spill! *nimblewill - a slender, branching American grass animals may graze on in the central United States. On the Hill is about Franzi and Camille who live on opposite sides of the same hill. They are happy where they live, but they miss human company. They both set off to go around the hill to see if they can find companionship. They each find the other one's empty house, but eventually find each other. 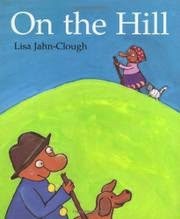 Lisa Jahn-Clough is a children's picture book author and illustrator. She lived on a farm in Rhode Island until the age of 10, but summered on Monhegan Island, Maine. Her family moved to coastal Maine when she was 10. She grew up in Brunswick, has lived in the Boston area, and now lives in Portland, Maine. She was the director of Children's Writing Certificate Program at Emerson College in Boston, and taught there for several years. She is also is a member of the faculty in MFA Writing for Children and Young Adults at Hamline University. She leads workshops for children on book-making and for adults on writing, illustrating and publishing children's books. Only Cows Allowed The cows decide that no one is allowed in the barn except them. The hens formulate a plan to get every animal back into the barn where they belong. Lynn Plourde is a native of Dexter, Maine, and now lives in Winthrop, Maine. More about Lynn Plourde here. Lynn's book, A Mountain of Mittens, was featured for the letter M, also. P, where could you be? This poem form is a Nonet, with nine lines. The first line has nine syllables, and each line decreases in its number of syllables until the last line, which has one syllable. It can be about any subject and may or may not rhyme. It seemed to work nicely for this poem - it can look like a fishing net in the water or like from the bottom you are looking up into the huge night sky. A Net of Stars is about a young girl conquering her fears. More about the book and Jennifer Richard Jacobson here on Jennifer's website. Jennifer Richard Jacobson lives in Cumberland, Maine. 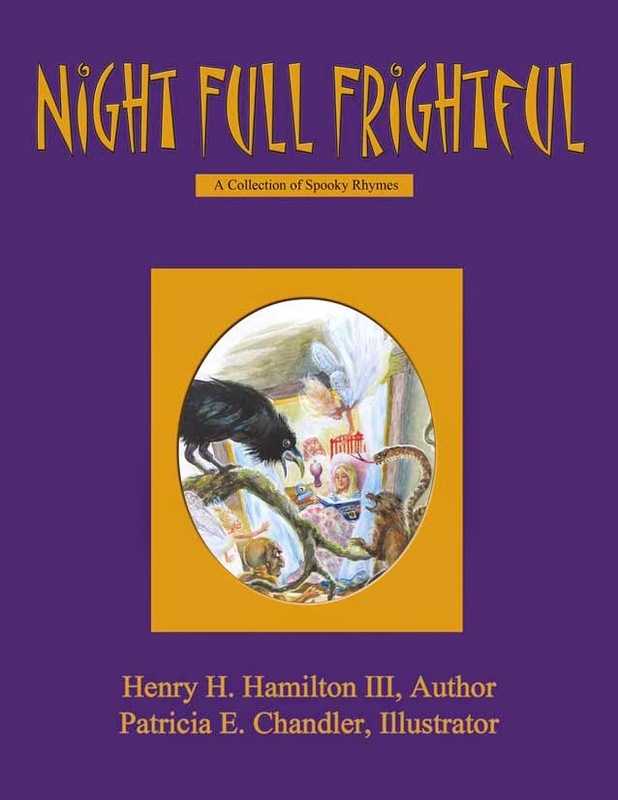 Night Full Frightful is a collection of scary poems, published in 2013. Henry Hamilton was born in Lewiston and now lives in Otisfield, Maine. I would have written a poem for this title, as it is full of potential, but the book is already a book of poems, and I don't want to step on toes! 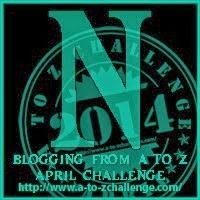 This post was brought to you by the letter N! O, what letter is next.